China launched Venezuela's second satellite on Saturday, delivering the spacecraft into a 400-mile-high orbit to monitor the country's territory, survey crops and natural resources, and aid Venezuela's security services. The satellite lifted off from the Jiuquan space center in northwest China at 0412 GMT (12:12 a.m. EDT) atop a Long March 2D rocket. The two-stage launcher deployed the Venezuelan Remote Sensing Satellite, or VRSS 1, into orbit less than 13 minutes later. Launch occurred at 12:12 p.m. Beijing time. Venezuelan state television broadcasted the launch live, showing President Hugo Chavez and aides applauding as the rocket soared into space. Tracking data show the spacecraft is orbiting nearly 400 miles high with an inclination of 98 degrees. China is delivering the VRSS 1 satellite to its customer in orbit under a contract signed with the government of Venezuela in May 2011. VRSS 1 is the first remote sensing satellite China has delivered in orbit to an international customer. 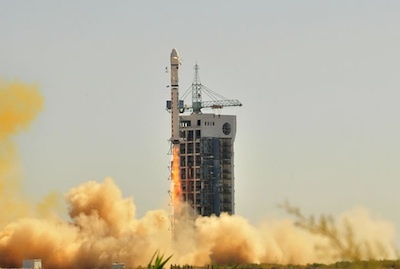 The satellite was built by China Academy of Space Technology, and the launch was arranged by China Great Wall Industry Corp., the state-owned firm responsible commercial Long March rocket missions. VRSS 1 is Venezuela's second satellite built by China, which launched a communications satellite named Venesat 1 in 2008. Venezuelan state media reported the VRSS 1 project cost about $140 million. The satellite was named after Francisco de Miranda, a Venezuelan revolutionary hero. Venesat 1 was nicknamed Simon Bolivar, after the leader of Venezuela's struggle for independence. The Miranda satellite will assess Venezuela's soil and water resources, collect images to help urban planners, monitor illegal mining and drug activities, and strengthen national defense, according to Venezuelan state television. The craft's sensors can resolve objects 2.5 meters, or 8.2 feet, across. The satellite will return 350 images per day during its five-year mission, according to Jorge Arreaza, Venezuela's minister for science, technology and innovation. The Miranda satellite will collect its first image around Oct. 10, a posting on a Venezuelan government website said. VRSS 1 will be operated by the Bolivarian Agency for Space Activities on behalf of the Venezuelan government.